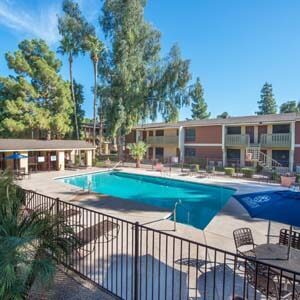 Cushman & Wakefield announced today the $25.2 million sale of Crossroads Apartments, a 316-unit apartment community located at 2222 West Beardsley Road in Phoenix, to Phoenix-based CS1031 Crossroads Apartments (Rincon Partners). Cushman & Wakefield Executive Managing Directors David Fogler and Steven Nicoluzakis of the Phoenix office represented the seller, WW Crossroads Apartments LLC (Olympus Property) of Fort Worth, Texas. Crossroads is a well maintained Class B apartment community, with great value-add potential, located on Beardsley Road and 23rd Avenue in the Deer Valley submarket. “With immediate access to the I-17 and Loop 101 freeways, this outstanding location provides easy access to entertainment, shopping, dining, employment and excellent freeway access,” said Nicoluzakis. The property, built in 1982, sits on 10.4-acres and currently offers one-, two- and three-bedroom floor plans. Crossroads offers its residents gated access, a brand-new, fully remodeled clubhouse and leasing center, two resort-style swimming pools, lighted tennis courts and basketball courts, covered playground, community business center, four on-site laundry rooms, door-to-door valet trash service and a park-like setting with fountains.